The Canadian Rockies offer some incredible wedding venues for you to elope that will make saying your I do's a memorable event for the just the two of you or a gathering of your closest loved ones. Whether you are looking for a rustic cabin, an elegant Castle in the Rockies or to hold your wedding ceremony on top of a mountain with a helicopter to get you there the possibilities are inspiring and easy. 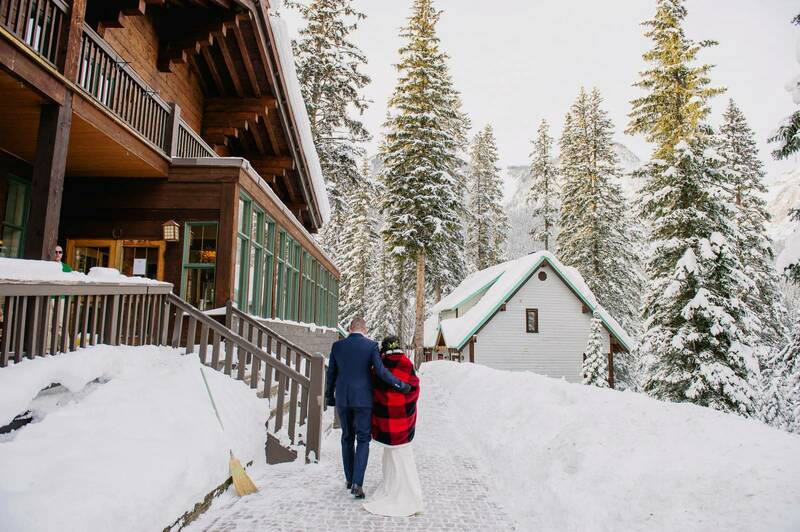 Many of the wedding venues in the Canadian Rockies offer elopement packages that will include a cozy cabin, a beautiful spot for your ceremony, sparkling wine, dinner for two and a wedding cake to celebrate. Elopements happen year round in the mountains every day of the week. Choose a weekday for a quieter more private experience. Whether you are dreaming of a winter wonderland for your elopement or spending time in a canoe on a glacier fed lake the Canadian Rockies will make your elopement an adventurous experience. Make sure to book some time in the mountains after becoming Mr & Mrs to explore more together as there are lots of things to do in the mountains. I hope this blog post will help you plan your elopement in the mountains. Emerald Lake Lodge is located in Field, British Columbia and is about an hour and 10 minute drive from Banff. It is famous for it's stunning Emerald green lake in the summer and offers an incredible winter wonderland in the winter months. Their cabins include wood burning fireplaces and the perfect place to unplug without the distraction of wifi or cellphone coverage. Below is the viewpoint available for your elopement ceremony in all seasons. 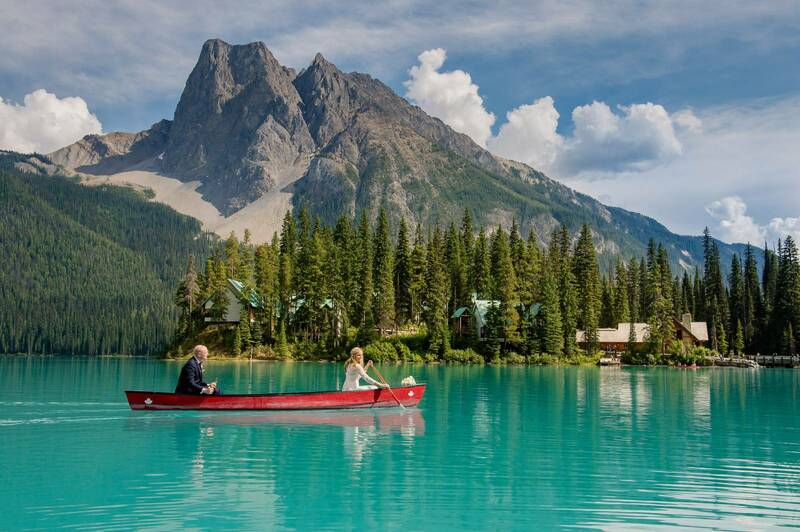 Emerald Lake Lodge has an amazing elopement package that includes all you need for your wedding and a romantic stay in your own cabin. Located a mere 20 minutes from the town of Banff you'll find the historic rustic romantic cabins of Storm Mountain Lodge. With woodburning fireplaces and exceptional food in the main lodge. In the winter the staff creates a snowshoe trail around the property and in the summer it's the perfect place to use as a home base for exploring all the favourite spots in the Canadian Rockies. Get married in your cabin or on the property depending on the season. If you are looking for something adventurous, totally private and unique for your mountain elopement then book a Heli Elopement with Mountain View Helicopters. You will be flown up to the top of a mountain for a totally private ceremony with opportunities for photos before taking a tour of the mountains in your helicopter as Mr & Mrs.
Alpine Helicopters in Canmore also offers Heli Elopements. The Fairmont Chateau Lake Louise is mere steps away from the iconic Lake Louise with lots to do in the area in both summer and winter. Summer at Lake Louise is incredibly busy but staying at the Chateau allows you the opportunity to experience Lake Louise in the quiet early mornings or evenings when the majority of tourists have left for the day. In the winter you can take a horse drawn sleigh ride to a frozen waterfall and get married right on the frozen lake or stay warm and have a private ceremony in their intimate Lefroy room. Summer offers time spent out on a canoe or hiking to two teahouses. The Post Hotel is a hidden gem located in Lake Louise on a quiet road along the river. Located just down the hill from Lake Louise you'll find a quiet retreat at The Post. You can get married in their intimate library or on the grounds in all seasons with cozy riverside cabins, a beloved spa in the hotel, a world famous wine collection and exceptional service that brings couples back year after year. Eloping at Cathedral Mountain Lodge in Yoho is a beautiful location for those looking a private quiet experience set amongst nature. Located in Yoho National Park just an hour and ten minute drive from the town of Banff you'll find the beautiful Cathedral Mountain Lodge with it's private cabins with woodburning fireplaces and soaker tubs. The main lodge offers yummy buffet breakfasts and gourmet meals followed up by s'mores on the deck most evenings. Cathedral Mountain Lodge is only open during summer & fall and offers lots of hiking opportunities near by. Cathedral Mountain Lodge offers an elopement package. The Fairmont Banff Springs is known as the Castle in the Rockies and offers lots of options to elope or host an intimate wedding in the mountains. Their Royal Suite is stunning and is the perfect place for a totally private ceremony for just the two of you. For an intimate gathering the Angus room is a favourite spot, as well as, the Oak Room, Observatory or the Ivor Petrak room for a little bigger gathering. One of the benefits of a Banff Springs wedding is that if the weather doesn't cooperate there are lots of beautiful spots within the castle to take all your wedding photographs. You can walk into downtown Banff from the Banff Springs or relax inside their beautiful spa and pools. The conservatory on the left offers beautiful mountain views and the Angus room on the right is a cozy spot that can host both your ceremony and small dinner reception. Moraine Lake is perhaps the busiest location in the Canadian Rockies and it's easy to see why it draws thousands of tourists. You can canoe with a view of the ten peaks and there are some of the best hiking trails in the Canadian Rockies just steps from Moraine Lake Lodge. If you plan on eloping at Moraine Lake definitely book a cabin at Moraine Lake Lodge for the best possible experience. Having a private cabin at Moraine Lake will give you the opportunity to enjoy Moraine Lake when most of the tourists leave. You'll be given a parking spot at the lodge and treated to a beautiful view of the lake from your cabin with a wood burning fireplace. I don't recommend eloping at Moraine Lake without having a cabin booked at Moraine Lake Lodge for your home base. It should be noted that in the case of inclement weather there isn't a backup indoor location. I would plan your ceremony for either before 8am or after 6pm for slightly less crowds and tour buses. A lot of wedding vendors won't service Moraine Lake weddings because it is impossible to reach the lake due to thousands of tourists and road closures. It should be noted that Parks Canada often closes the road to Moraine Lake when the area is over capacity at peak daytime hours. The road to Moraine Lake closes for the winter based on snowfall therefore the date that it opens and closes changes every year based on weather. Typically the road opens in the last week of May and closes in the first week of October. But it has been delayed opening into June based on snow and closed as early as the last week of September. Be sure to check with Parks Canada before planning a trip to avoid disappointment. Located along the Bow Valley Parkway in Banff National Park in between the town of Banff and the village of Lake Louise you'll find the Baker Creek Resort with cozy cabins and a delicious bistro on site. You can get married by the creek in the summer or winter. Located in the quiet residential neighbourhood of Cougar Creek in Canmore you'll find Creekside Villa. There is an option for an outdoor ceremony or indoor ceremony both on the property. Creekside Villa offers an elopement package (Monday thru Thursday) with everything you need for your wedding day for just the two of you or up to 15 guests. 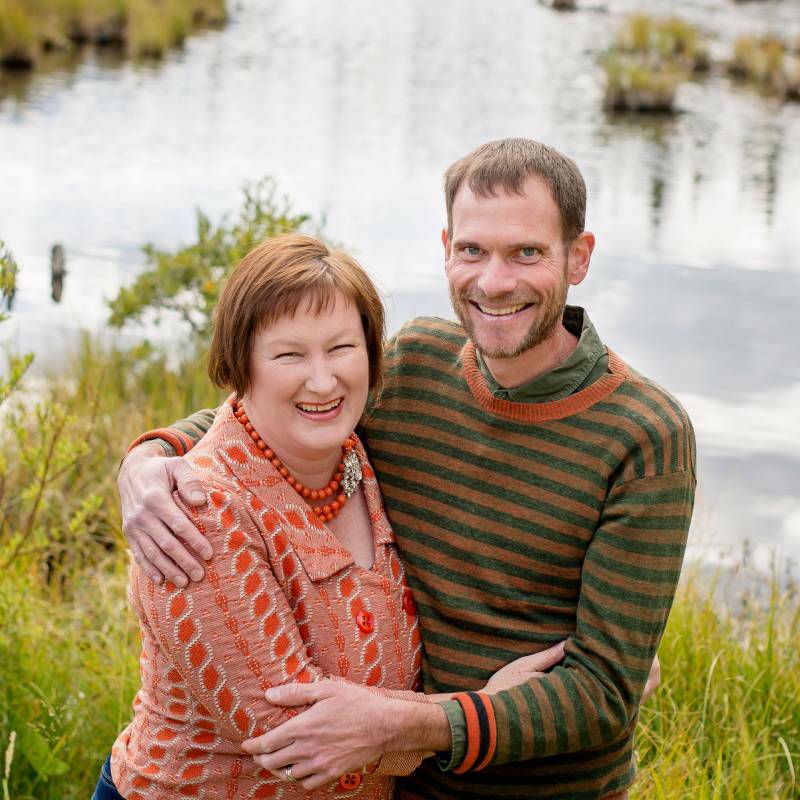 Located in Canmore the Bear & Bison Inn offers all inclusive elopement packages that allow you to get married at the inn at their outdoor gazebo or choose an outdoor ceremony in the mountains followed up with dinner at the inn. If you are looking for a totally unplugged back country lodge experience you can head to Mount Engadine Lodge located in the Spray Valley Provincial Park about 40km from Canmore. It's a favourite spot for moose to visit in summer and the perfect place for snowshoe hikes in the winter. If you want to try out their mountain hospitality stop in for their afternoon teas at the lodge.